Home New York Giants New York Giants: Could The Giants Find A Franchise Quarterback After Round One? The New York Giants‘ roster is filled with holes. On defense, and on offense, the Giants are missing multiple key players. At quarterback, the Giants seem to be set for 2019 with Eli Manning. However, Eli Manning is 38 years old. The Giants will have a hole open up at the quarterback position as soon as Eli retires. That is unless the Giants draft a guy to step in once Eli retires. Finding a franchise quarterback after round 1 is an extremely difficult task. It is a rare occasion. But, it is not impossible. Looking within the division, the Giants’ arch-rival, the Dallas Cowboys, found their quarterback after round 1. Dak Prescott was drafted in the 4th round of the 2016 NFL Draft. Dak is not the only “franchise quarterback” in the NFL who was not drafted in round 1. Russell Wilson is one of the most notable recent mid-round franchise quarterbacks. Wilson was drafted by the Seattle Seahawks in the 3rd round of the 2012 NFL Draft. Since then, he has lead the Seahawks to a Super Bowl victory and been to 5 Pro Bowls. Despite this, it is still rare for franchise quarterbacks to be taken after round 1. 26 of the 47 NFL quarterback that have won Super Bowls were taken in the 1st round of the draft. 14 of them were the 1st overall pick. The 2nd round has only produced 3 Super Bowl-winning quarterbacks. Statistically, 1st round quarterbacks have had significantly better careers than those of the later rounds. However, there are a few outliers that give teams hope that they can find their guy later in the draft. Who could the Giants draft at quarterback in the middle of the 2019 NFL Draft to be their outlier? There is one quarterback option in the 2019 NFL Draft that could be a late or mid-round sleeper. Out of Buffalo, Tyree Jackson has flashed true NFL potential. Tyree Jackson has the perfect size to play the quarterback position at the next level. He is 6 feet 7 inches, 245 pounds. The strong-armed quarterback had an impressive junior year to put him on NFL scouts’ radars. In 2018, Jackson threw for 3,131 yards and 28 touchdowns with only 12 interceptions. Jackson’s talents do not end with his passing ability. Tyree Jackson is also a threat on the ground. Jackson racked up 7 rushing touchdowns in 2018. He is not only tall, but Jackson is also fast. At the 2019 NFL Scouting Combine, Tyree ran a 4.59 40-yard dash. He has the speed and arm strength to be a serious dual-threat at the next level. Tyree Jackson is similar to Josh Allen. However, Josh Allen was a top-10 pick last year. Jackson will be available after round 3. Both quarterbacks are tall and athletic. They both have incredible arm strength. Jackson compares well to Allen and many other quarterbacks to come out in recent years. However, playing at Buffalo, Jackson did not play much top-end competition, causing him to be looked at as a mid-round prospect. This could make Tyree Jackson the 2019 NFL Draft’s biggest steal. He might need a couple of years to develop, but Jackson has the potential to be a great player at the next level. 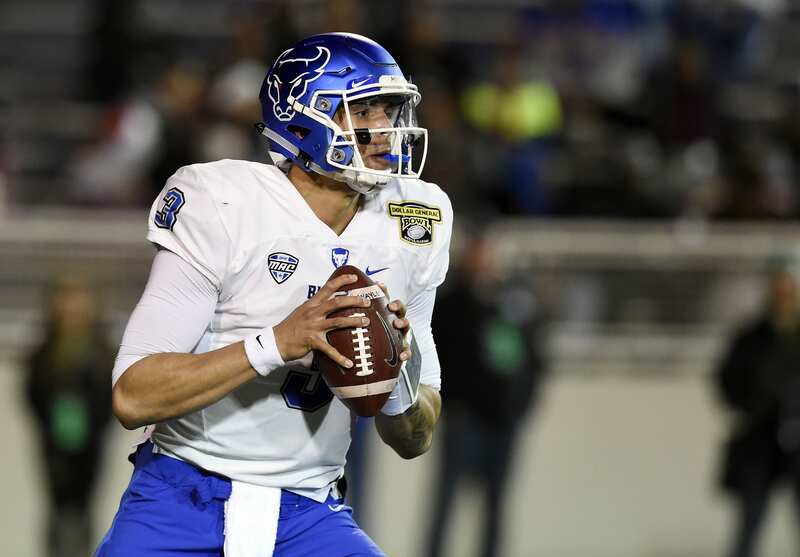 If the Giants do not take a quarterback in the 1st round of the 2019 NFL Draft, they need to target Tyree Jackson in the later rounds. Possibly the strongest arm in the class, today’s #WNSPOTD is @UBFootball QB Tyree Jackson.